Product prices and availability are accurate as of 2019-04-22 01:31:31 EDT and are subject to change. Any price and availability information displayed on http://www.amazon.com/ at the time of purchase will apply to the purchase of this product. 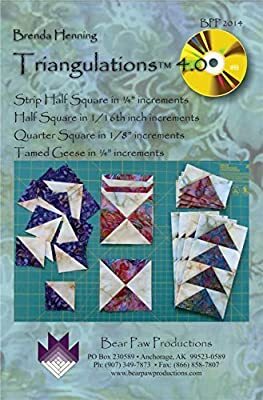 Bear Paw Productions Triangulations 4.0 Software CD takes half-square and quarter-square triangle construction to a whole new level. Imagine the freedom of having any size triangle foundation in your hands at the touch of a button. Version 4.0 adds the ability to create STRIP Half Square Foundations in sizes 1/2 inch to 4 inch in 1/4 inch increments. As in previous versions, you can print Half-square triangle foundations in sizes 1/2 inch to 7 1/2 inch in 1/16 inch increments, Quarter square triangle foundations sizes 3/4 inch to 7 1/2 inch in 1/8 inch increments, and Tamed Geese foundations in sizes from 1/2" x 1" to 3 3/4" x 7 1/2". Print as few or as many as you need. Includes four bonus patterns. Formatted to fit standard 8 1/2"x 11" computer paper. The disk runs on any PC or Mac computer with Adobe Reader.